IT Support Engineers maintain and monitor the network and computer systems of the company. The job description listed on the IT Support Engineer Resume includes some or all of the following – installing and configuring computer systems, diagnosing hardware and software defects, solving technical issues and application problems, replacing parts, supporting new application roll-outs, setting up user account and password for employees, testing and evaluating new technologies, ensuring safety checks on computer systems, escalating unresolved issues to senior management, managing several open issues simultaneously and ensuring optimal functioning of IT Systems. 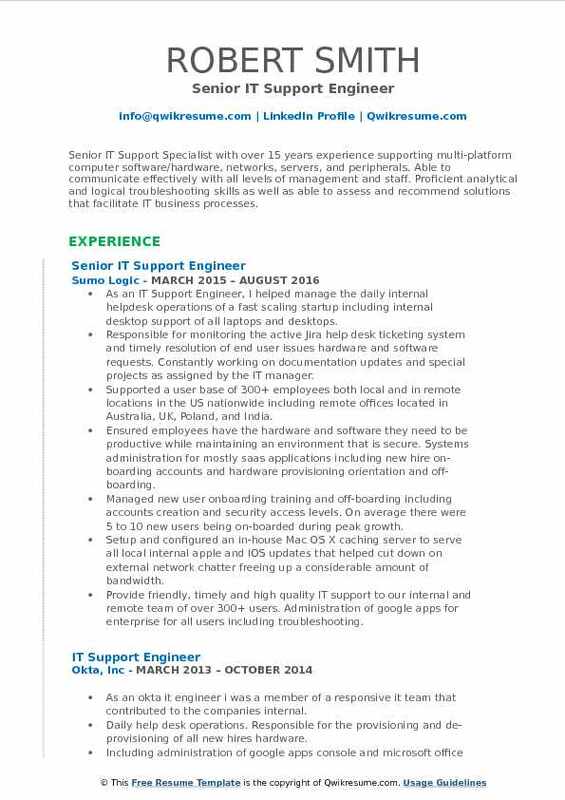 Candidates entering to provide tech support should be able to demonstrate the following skills and abilities – technical support expertise, hands-on experience with Windows/ Linux/ Mac OS Environment; solid understanding of computer systems and other tech products; and the ability to provide step-by-step instructions. The qualifications required for this job include a degree in Computer related field with a certification in Linux, Microsoft, Cisco or similar technologies. Objective : To acquire a position within the field of Information Technology with a company that will allow me to demonstrate my skills, knowledge, and desire to grow as an individual. I am looking to acquire a position with a company that provides the opportunity for further growth and development within the company. Created and managed email distribution lists, managed users and added/removed users to/from email groups, exported/imported pst files using exchange admin center in exchange 2013. Created user accounts, edited user account information, reset user passwords and removed access to the network utilizing active directory. Enabled forwarding of user emails to the desired person using Microsoft Exchange admin center. Managed user mailbox size and increased mailbox size using Microsoft Exchange admin center. Removed users from Lync email listing using Microsoft Lync server 2013. Peripheral installation/support (LAN/local printers, card readers, scanners, etc. ). Rack n stack servers/ switches/storage drives, run cabling (cat5 and fiber), configure ilo, and break/fix servers, storage drives, etc at our qts data center rack space. Installed/replaced power supplies, network cards and additional ram in HP and Dell servers. Performed break-fix repairs such as hard drives, power supplies, cooling fans, and ram replacement. Remotely connect to customers utilizing Lync or TeamViewer to resolve any issues. Objective : IT Support Engineer with a year of experience in providing comprehensive technical support to end-users. Successful in installing, configuring applications on Windows operating systems and providing IT technical support. Collaborate with team and Managers to complete the task in time with the ability to discover issues, resolve defects and ensure client expectations are met with high-quality support. Skills : SQL, TESTING, ACTIVE DIRECTORY, IIS, INTERNET INFORMATION SERVICES, Implemented automation using Selenium, JIRA and Bugzilla. Created, updated and reviewed Test cases and Test Scenarios. Performed various types of testing throughout Software Testing Life Cycle (STLC) and Bug Life Cycle (BLC). Provided 1st line technical support; answering support queries via ticketing tool, phone, and email. Maintain a high degree of users service for all support queries and adhere to all service level agreement. Respond to inquiries from clients and help them resolve any hardware or software problems. Following the evolution of all aspects: documentation and the proper processing of the ticketing operation. Appropriate management and timely information on the results occurred depending on the priority issues and impact, providing technical support effectively. Answered incoming calls and logged all users questions and issues accurately and efficiently into the ticketing system. Work closely with development team and install the development related tools. Attend weekly team meeting and update the any open issues and update on any escalation. Monitored the alerts generated by the servers and ensure proactive measures are taken to prevent any major hardware failure. Log incidents and maintain records of all calls from users using the designated tool. 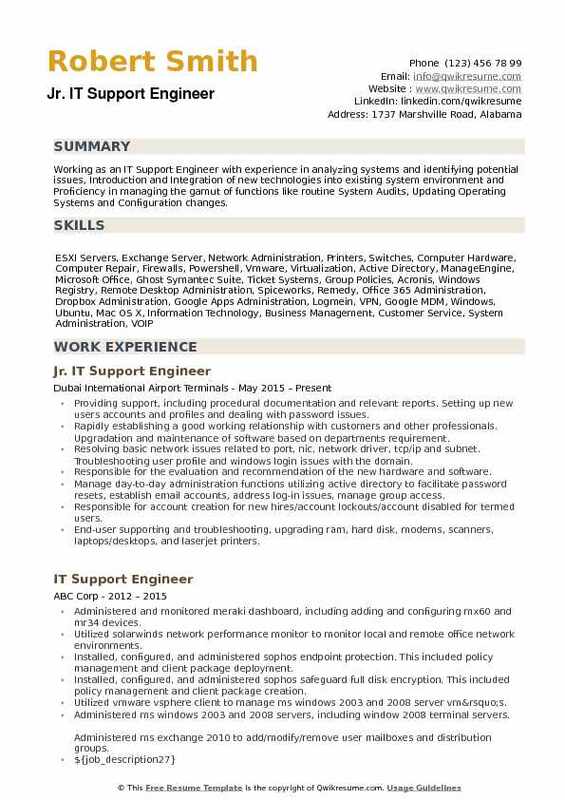 Summary : Seeking a position as a Network Administrator or Support helpdesk for all IT needs. Seeking growth opportunities utilizing my technical skills and experience. Working on obtaining my A+ certification currently. Skills : Technical Planning, User Training, Migrations And Deployment, Help Desk Operations, System Installations/Upgrades, Hardware/Software Testing, Desktop Support, System Integration, Connectivity Maintenance, Experience In POS & Security Surveillance Camera Systems. Developed and maintained end-user self-service trouble-shooting reference manual allowing users quick solutions to common issues which resulted in a 25% reduction in service desk requests. Modifications, exchange account setup and modification and managed large-scale file shares. Handles the deployment, monitoring, maintenance, development, upgrade and support of all IT systems, including telecommunications, email, pcs, operating systems, hardware, software, mobile devices, peripherals and office equipment. Provides on-site and remote end-user services, including help desk and technical support services. Diagnosed and troubleshoot the system and network problems and provide solutions for hardware and software faults. Working knowledge of vmware vsphere client including working remotely with desktop and servers. Working knowledge of active directory and office 365 account administration, such as creating an account, permissions, resetting passwords or creating group accounts. 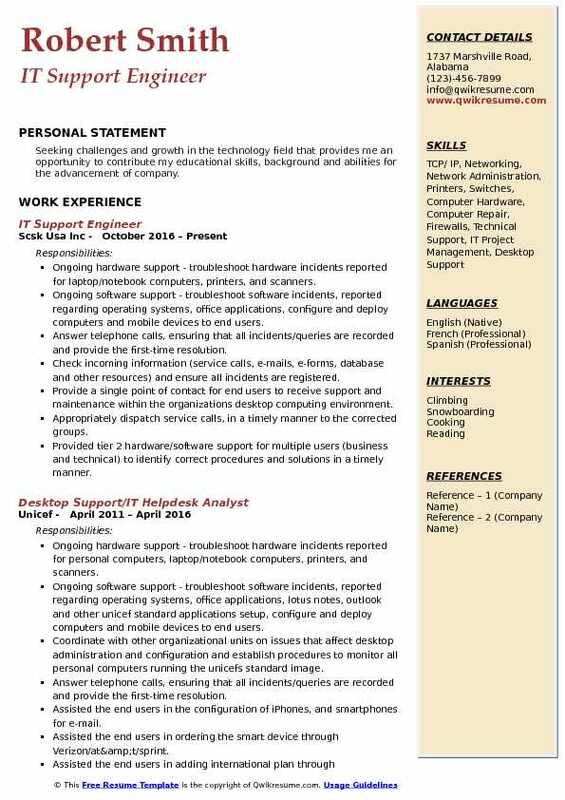 Summary : Senior IT Support Specialist with over 15 years experience supporting multi-platform computer software/hardware, networks, servers, and peripherals. Able to communicate effectively with all levels of management and staff. Proficient analytical and logical troubleshooting skills as well as able to assess and recommend solutions that facilitate IT business processes. Skills : Macintosh Specialist, Google Apps For Enterprise, Office 365 Admin, Atlassian, VOIP Telco. 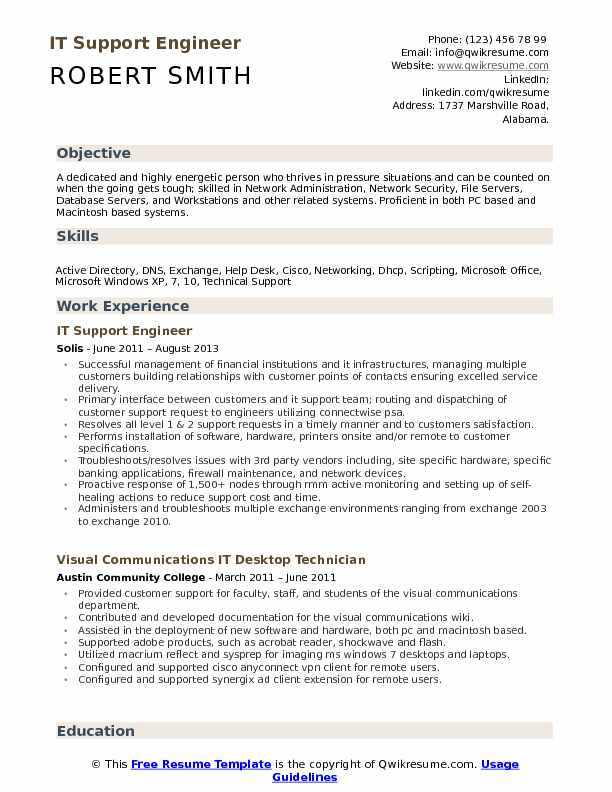 As an IT Support Engineer, I helped manage the daily internal helpdesk operations of a fast scaling startup including internal desktop support of all laptops and desktops. Responsible for monitoring the active Jira help desk ticketing system and timely resolution of end user issues hardware and software requests. Constantly working on documentation updates and special projects as assigned by the IT manager. Supported a user base of 300+ employees both local and in remote locations in the US nationwide including remote offices located in Australia, UK, Poland, and India. Ensured employees have the hardware and software they need to be productive while maintaining an environment that is secure. Systems administration for mostly saas applications including new hire on-boarding accounts and hardware provisioning orientation and off-boarding. Managed new user onboarding training and off-boarding including accounts creation and security access levels. On average there were 5 to 10 new users being on-boarded during peak growth. Setup and configured an in-house Mac OS X caching server to serve all local internal apple and IOS updates that helped cut down on external network chatter freeing up a considerable amount of bandwidth. Provide friendly, timely and high quality IT support to our internal and remote team of over 300+ users. Administration of google apps for enterprise for all users including troubleshooting. Created, updated and maintained document workflows, user resources, and IT processes. Enforced IT policies including security, email, accounts, passwords, and compliance. 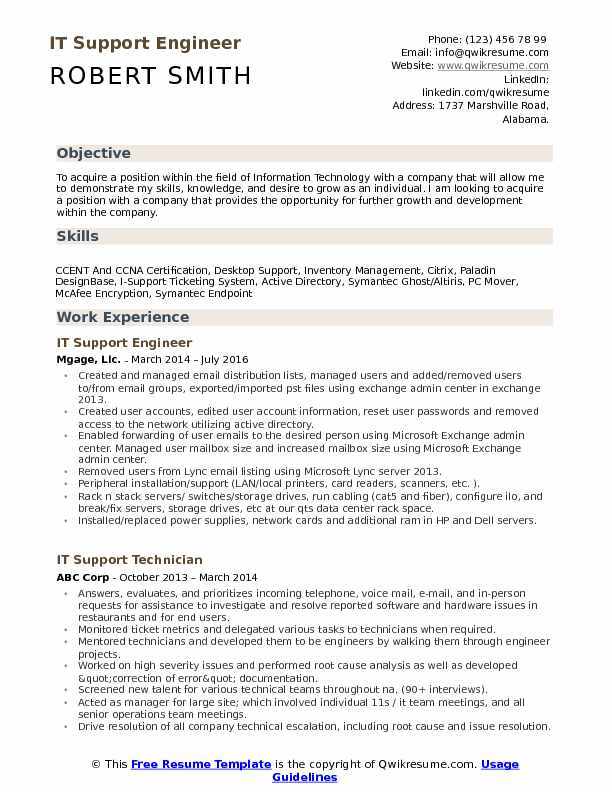 Objective : Seeking a position in Information Technology as Technical Support Engineer, that would best utilize my skills and enthusiasm to make a significant contribution & add value to an organization. Skills : Created and Configured VLANs, Tunnels, and Trunks Etc. Deployed Windows & UNIX Operating Systems Ghost Images on Multiple Systems Using PXE Boot. Experience with Firewalls (Cisco, Juniper, SRX, ASA) and ACL Configuration. Strong Knowledge Of CIDR / Subnet Masking. Responsible for migrating 100s of desktops, laptops, and notebooks to a new domain. Replaced computer name with machine serial number and configured domain name and then rebooted the system to verify by login into the domain using tech credentials. Setup, configured and verified local and network (hp, canon, zebra) printers. Administration of vmware esx and esxi servers on Dell PowerEdge servers. Installed, upgraded, replaced routers, switches, patch panels, servers and network cables as needed. Troubleshoot and resolved DNS and DHCP issues in Windows and Linux platform. Configured and creating/ adding/ removing VLANs, trunks etc on Cisco switches and routers. Troubleshoot cat6a (drops) connectivity issue using "fluke" testing tool. Configured, tested and verified zebra (200 - 600 dpi) printers using linux production server. Created straight and crossover patch cables base on t568a and t568b wiring schemes and tested using "fluke" testing tool. Troubleshoot network issues using ping, nslookup, arp, netstat, ipconfig, tracert, cmds etc. Assisted floor support, dba team, DHCP team and network architecture engineers. 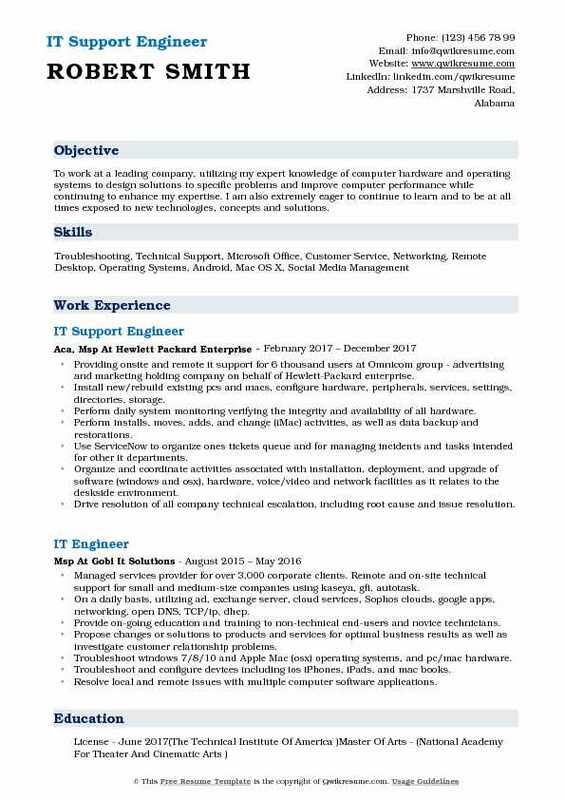 Objective : To work at a leading company, utilizing my expert knowledge of computer hardware and operating systems to design solutions to specific problems and improve computer performance while continuing to enhance my expertise. I am also extremely eager to continue to learn and to be at all times exposed to new technologies, concepts and solutions. Providing onsite and remote it support for 6 thousand users at Omnicom group - advertising and marketing holding company on behalf of Hewlett-Packard enterprise. Install new/rebuild existing pcs and macs, configure hardware, peripherals, services, settings, directories, storage. Perform daily system monitoring verifying the integrity and availability of all hardware. Perform installs, moves, adds, and change (iMac) activities, as well as data backup and restorations. Use ServiceNow to organize ones tickets queue and for managing incidents and tasks intended for other it departments. Organize and coordinate activities associated with installation, deployment, and upgrade of software (windows and osx), hardware, voice/video and network facilities as it relates to the deskside environment. Drive resolution of all company technical escalation, including root cause and issue resolution. Lead and oversee day-to-day helpdesk operations to exceed customer expectations by delivering quality SLA response times and resolutions. 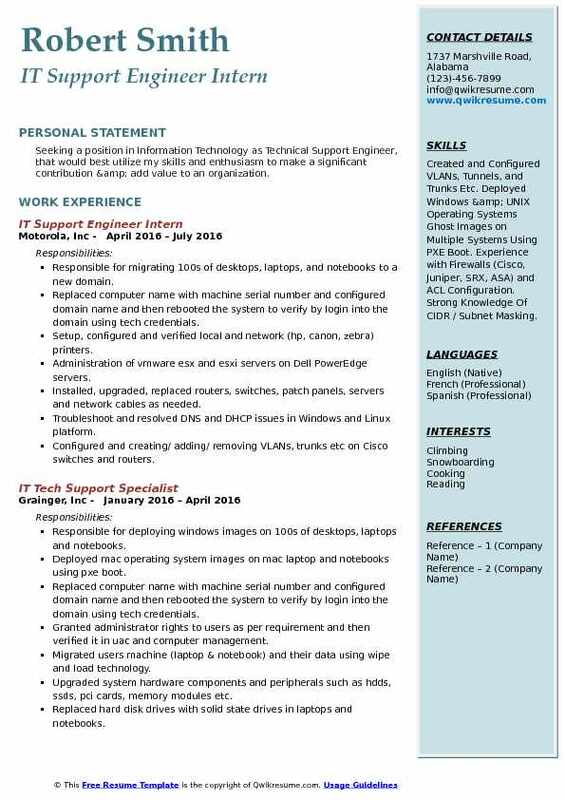 Objective : 4+ years of experience in IT industry. Progressive experience in a Network Operation Center (NOC), IT Operations, Helpdesk. Working knowledge of Windows Server, server applications and infrastructure architecture Incident & problem management experience based on ITIL foundations Incident handling, Windows server monitoring, debugging environments to determine root cause. 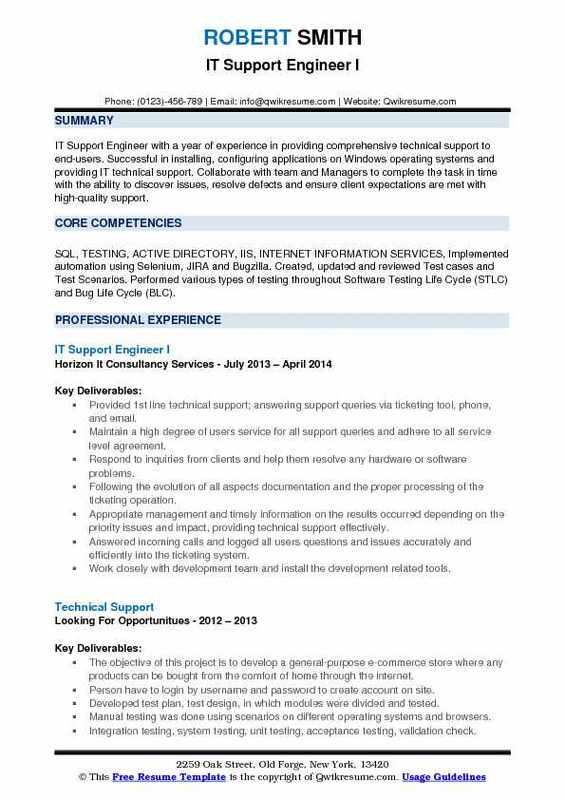 Strong experience in providing 1st/2nd line IT Support Working experience. Maintaining the case tracker on daily basis via incident management tool. Identifying problem investigation, assignment issues, acting as an initial escalation point for day-to-day IT problems. Daily coordinate with dealer, reseller and end-user and logistics team. Regular monitoring & follow up for call closure with engineers, dealer, and logistics team. Co-coordinating with the onsite tech & leads for getting the issue resolved. Reviews and analysis - reviews on SLA breach cases, reports, critical cases and daily analysis of IT requests. Respond to incoming telephone calls and emails assistance from users experiencing problems.Report generation- daily, monthly, engineers productivity, problem cases, change cases. Coordinating with the onsite tech & leads for getting the issue resolved. Support and resolution experience with windows 7, outlook and connectivity issues. Identifies and resolves technical issues and/or researches and recommends effective solutions. Ensures a timely resolution and/or escalates non-resolvable issues to higher-level teams. Adheres to departmental standards and ensures appropriate use of information systems Monitors and enforces policies and procedures. Headline : Computer Science, CompTIA A+, CCNA, MCSE and Red Hat Certified Engineer. 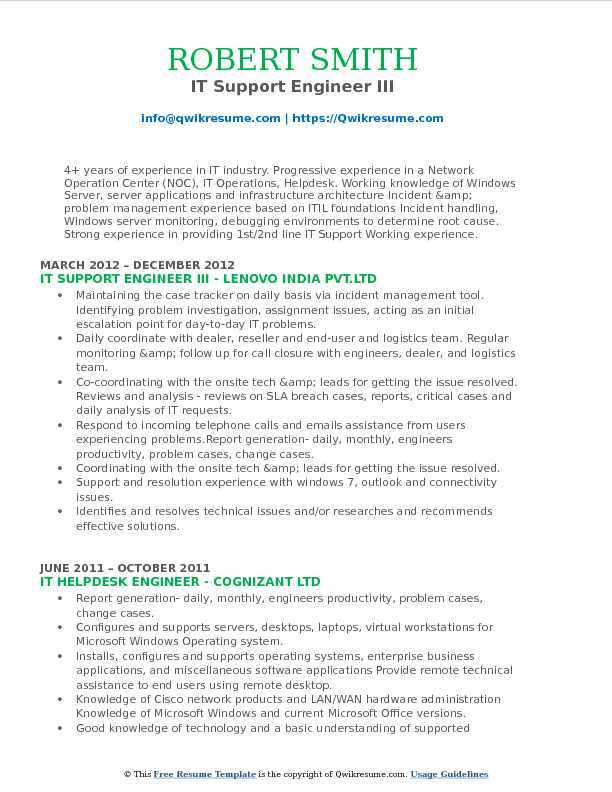 7+ Years of experience with Enterprise level companies in Deskside Support, IT and Analyst. Configured, deployed, maintained and troubleshoot computer, laptops, printers, network, iPhones & iPads, peripherals, and docking stations. Provide support to clients; over the phone, remotely, email, and screenshots and in-person. 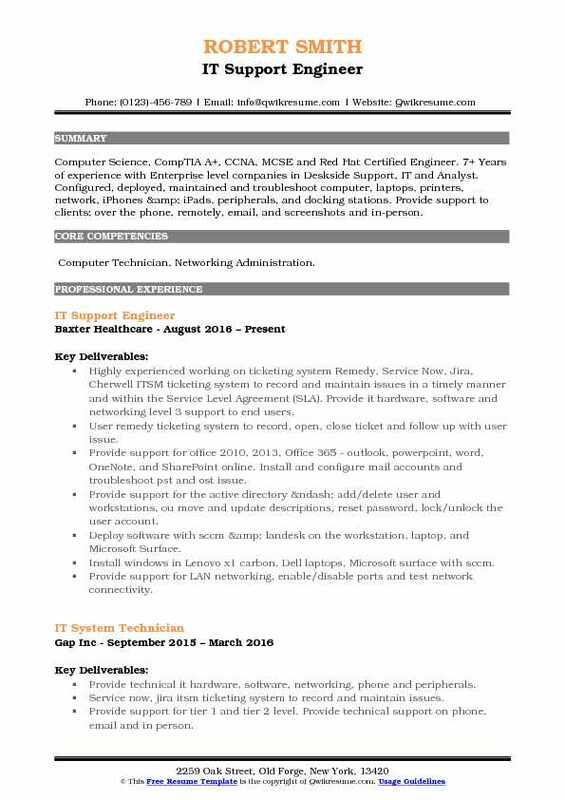 Skills : Computer Technician, Networking Administration. Highly experienced working on ticketing system Remedy, Service Now, Jira, Cherwell: ITSM ticketing system to record and maintain issues in a timely manner and within the Service Level Agreement (SLA). Provide it hardware, software and networking level 3 support to end users. User remedy ticketing system to record, open, close ticket and follow up with user issue. Provide support for office 2010, 2013, Office 365 - outlook, powerpoint, word, OneNote, and SharePoint online. Install and configure mail accounts and troubleshoot pst and ost issue. Provide support for the active directory – add/delete user and workstations, ou move and update descriptions, reset password, lock/unlock the user account. Deploy software with sccm & landesk on the workstation, laptop, and Microsoft Surface. Install windows in Lenovo x1 carbon, Dell laptops, Microsoft surface with sccm. Provide support for LAN networking, enable/disable ports and test network connectivity. Provide access to the user with share drive, box, box sync app, data privilege and map network drives. Connect machines with network printers and troubleshoot issues related to printer. Deploy McAfee security, encrypt the drive, setup pre-boot login authentication. Analyst applications and provide support to submit and accelerate itss ticketing system in SLA. Work with fixed and aggressive deadlines and execute tasks in a high-pressure environment. Summary : Seeking challenges and growth in the technology field that provides me an opportunity to contribute my educational skills, background and abilities for the advancement of company. Ongoing hardware support - troubleshoot hardware incidents reported for laptop/notebook computers, printers, and scanners. Ongoing software support - troubleshoot software incidents, reported regarding operating systems, office applications, configure and deploy computers and mobile devices to end users. Answer telephone calls, ensuring that all incidents/queries are recorded and provide the first-time resolution. Check incoming information (service calls, e-mails, e-forms, database and other resources) and ensure all incidents are registered. Provide a single point of contact for end users to receive support and maintenance within the organizations desktop computing environment. Appropriately dispatch service calls, in a timely manner to the corrected groups. Provided tier 2 hardware/software support for multiple users (business and technical) to identify correct procedures and solutions in a timely manner. Tracking computer equipment warranty and non-warranty status information to ensure equipment still under warranty is serviced only by the vendor. Ability to communicate with the customer over the phone involving troubleshooting issues. 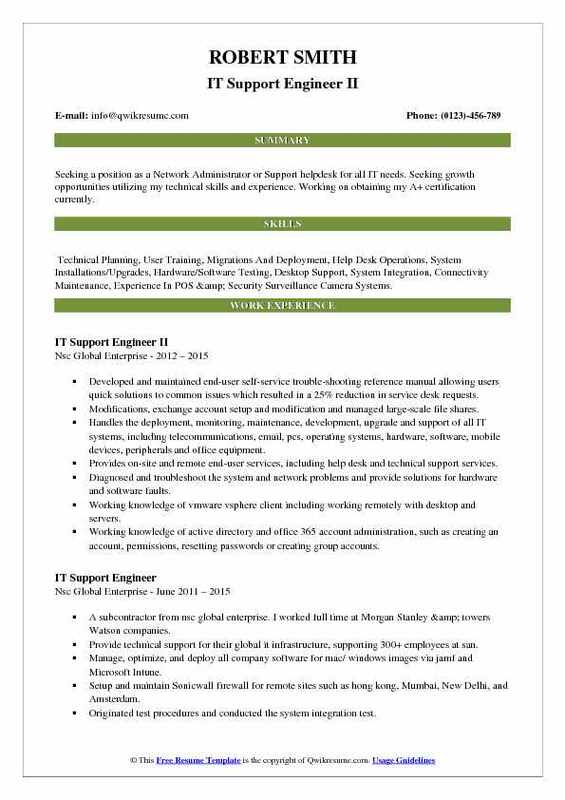 Headline : Working as an IT Support Engineer with experience in analyzing systems and identifying potential issues, Introduction and Integration of new technologies into existing system environment and Proficiency in managing the gamut of functions like routine System Audits, Updating Operating Systems and Configuration changes. Providing support, including procedural documentation and relevant reports. Setting up new users accounts and profiles and dealing with password issues. Rapidly establishing a good working relationship with customers and other professionals. Upgradation and maintenance of software based on departments requirement. Resolving basic network issues related to port, nic, network driver, tcp/ip and subnet. Troubleshooting user profile and windows login issues with the domain. Responsible for the evaluation and recommendation of the new hardware and software. Manage day-to-day administration functions utilizing active directory to facilitate password resets, establish email accounts, address log-in issues, manage group access. Responsible for account creation for new hires/account lockouts/account disabled for termed users. End-user supporting and troubleshooting, upgrading ram, hard disk, modems, scanners, laptops/desktops, and laserjet printers. Summary : A dedicated and highly energetic person who thrives in pressure situations and can be counted on when the going gets tough; skilled in Network Administration, Network Security, File Servers, Database Servers, and Workstations and other related systems. Proficient in both PC based and Macintosh based systems. Successful management of financial institutions and it infrastructures, managing multiple customers building relationships with customer points of contacts ensuring excelled service delivery. Primary interface between customers and it support team; routing and dispatching of customer support request to engineers utilizing connectwise psa. Resolves all level 1 & 2 support requests in a timely manner and to customers satisfaction. Performs installation of software, hardware, printers onsite and/or remote to customer specifications. Troubleshoots/resolves issues with 3rd party vendors including, site specific hardware, specific banking applications, firewall maintenance, and network devices. Proactive response of 1,500+ nodes through rmm active monitoring and setting up of self-healing actions to reduce support cost and time. Administers and troubleshoots multiple exchange environments ranging from exchange 2003 to exchange 2010. Travels to customer sites for projects including hardware setup and/or replacement, setup of new active directory infrastructure. Follows best practice and scheduling for patching client infrastructures, both microsoft and 3rd party applications. Compiles monthly it oversight reports for each client encompassing enterprise anti-virus management, patch management, rmm remote access, enterprise backup, critical systems (server) monitoring, and help desk ticket summaries. Performs customer specific desktop/laptop image build and deployment.